For over a decade Born To Love has been performing a Tribute show to one of rocks greatest legends, the one and only Freddie Mercury. The show has won rave reviews across the world and has made him one of the most sought after tribute acts in Europe. Born To Love as Freddie Mercury is one of the best acts you are likely to see and is a truly stunning and exhilarating experience. 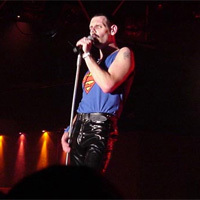 Playing to the audience is second nature as Born To Love "becomes" Freddie from the moment he steps onto the stage. The audience love him and he plays the part to perfection. Moving around the stage with incredible agility, "Freddie" displays some amazing dance moves.